Featuring 5 restaurants and extensive wellness facilities including indoor and outdoor pools, this hotel is located a 5-minute walk away from Avenida Revolução de Outubro. All accommodations offer views of Luanda. A satellite LCD TV and work desk are standard in the air-conditioned rooms, suites and apartments at EPIC SANA Luanda. They are chic in style and have a modern private bathroom, sometimes with glass walls. A breakfast buffet is available daily at EPIC SANA, and guests can enjoy international cuisine while admiring views of Luanda Bay and the city. Drinks and snacks are served at any of the 4 bars. A Turkish bath, sauna and hot tub offer relaxation after a busy day. There is also a fitness centre, a massage service and a hairdresser with a nail spa. Free Wi-Fi is provided, and there are several meeting rooms with audiovisual equipment. The reception service operates 24 hours a day and provides airport shuttles to Luanda Airport, 8 km away. Located along the Bay of Luanda and decorated in a modern colonial style, this hotel features an extensive breakfast buffet, a gym and a terrace. All rooms are air conditioned and offer free internet. The spacious rooms at Hotel Presidente Luanda come with views of the bay and the Isle of Luanda with its white beaches. All rooms have a work desk, cable TV and modern bathroom. Croissants and pastries are served daily in Restaurante La Rotisserie. Guests can also enjoy international and Angolese dinner options here. Cocktails are served at Bar Baía Azul. The 24-hour reception offers a car rental service and 24-hour room service. In addition they can arrange dry cleaning and ironing. This 4-star hotel is only 5 minutes’ drive from Luanda International Airport, and an airport shuttle is available. Featuring an outdoor pool, the Alvalade offers modern rooms with free Wi-Fi and a balcony. The air-conditioned rooms include a flat-screen TV with cable channels and a modern private bathroom with toiletries. Some include a spacious seating area. Guests can sunbathe on poolside loungers or enjoy a massage in a private treatment room. Alvalade also has a well-equipped gym and a beauty salon. A freshly prepared buffet-style breakfast is served at the restaurant. Guests can also enjoy a variety of international dishes at lunch and in the evening. It also has a bar and 24-hour room service. Just 5 minutes’ drive from Luandas’ city centre, Baía offers modern rooms with free Wi-Fi. Its spa includes an outdoor pool and a sauna. Free private parking is available. The air-conditioned rooms at The Baía come with a satellite flat-screen TV, fruit and water. All have a modern bathroom with a glass-walled shower. Guests can enjoy sunbathing on a cushioned lounger poolside. Relaxing massage treatments are offered at the spa, which also includes a modern gym. A buffet-style breakfast is served at the restaurant and international dishes are served in the evening. Room service, including breakfast, is also available. The 24-hour front desk can arrange car rentals and a laundry service. A shuttle to Luanda Airport, just 20 minutes by car, is available on request. 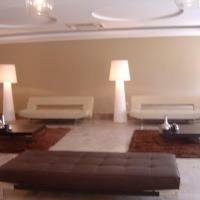 Located in the city centre of Luanda, Aparthotel Tropicana Luanda offers spacious studios and free Wi-Fi. The hotel features a rooftop bar with panoramic views of the city and Luanda bay, as well as a gym. Tropicana Luanda has elegantly decorated studios with modern furniture and tiled floors. Each of the air-conditioned units has a kitchenette with a refrigerator and a private bathroom with a bath tub. Guests can start their day with a breakfast buffet or enjoy their breakfast in the privacy of their room. The hotel’s à la carte restaurant serves local and international dishes, while the Bar Grand Caffé offers refreshing drinks. The Cathedral of Luanda is 2.5 km, while Quatro de Fevereiro International Airport is 7 km away. Free private parking is also available on site Aparthotel Tropicana Luanda. Offering an on-site restaurant, Mulemba Hotel offers an outdoor swimming pool, 9 km from Luanda city centre. All accommodations include a private balcony and free Wi-Fi access. Rooms at Luna Mulemba Resort include cable TV and a private bathroom with a hairdryer. Suites feature a seating area with a sofa. A breakfast buffet is available daily and guests can enjoy regional and international delicacies at Kwanza Restaurant. The next-door Dande Bar offers a refined setting for a drink. A business centre with broadband Internet is available at Mulemba, as well as meeting rooms for guests’ business needs. The poolside sun loungers and parasols provide a relaxing scenery. Luanda’s 4 de Fevereiro International Airport is 15 km away, and Luna Mulemba offers a shuttle service.